There’s little talk of actually building a physical wall, though, and more discussion of cameras, facial recognition and other technology. 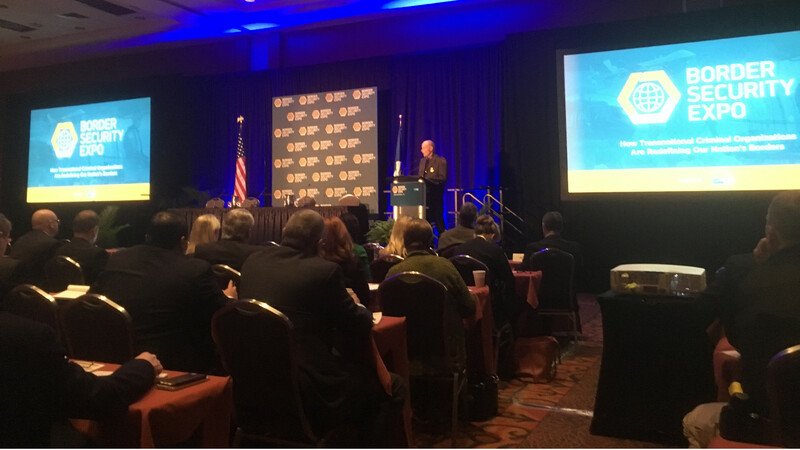 Gill is addressing a room of around 150 border-security industry executives at the 2018 Border Security Expo in San Antonio, Texas, describing the tidal wave of funding Customs and Border Protection and Immigration and Customs Enforcement have received from the Trump administration. This year border-security budgets have ballooned, growing 23 percent for border protection and 30 percent for immigration enforcement, two agencies that operate under Department of Homeland Security authority to enforce immigration laws and police borders. This is in stark comparison to budgets slashed 30 percent for the Environmental Protection Agency and the Department of State. Jay Ahern, former acting head of Customs and Border Protection and principal at the Chertoff Group, suggests to the crowd that this border-security funding boom mirrors that of the post 9/11 era. “We are surrounded by insurmountable opportunity,” adds Benjamin Huffman, chief of strategic planning and analysis for Customs and Border Protection. He enunciates each word slowly and carefully. The industry executives are attentive, situated at the helm of an industry whose time has come. An entrepreneurial spirit pervades the three day-conference. Homeland Security officials eagerly describe new frontiers to deploy technology and manpower, and few of these frontiers are anywhere near the physical border. Increased funding and personnel will allow the department to beef up interior enforcement and international operations like never before, which deputy director Elaine Duke calls “the away game of national security.” She describes how the border-security technology industry will play a crucial role in this expansion. 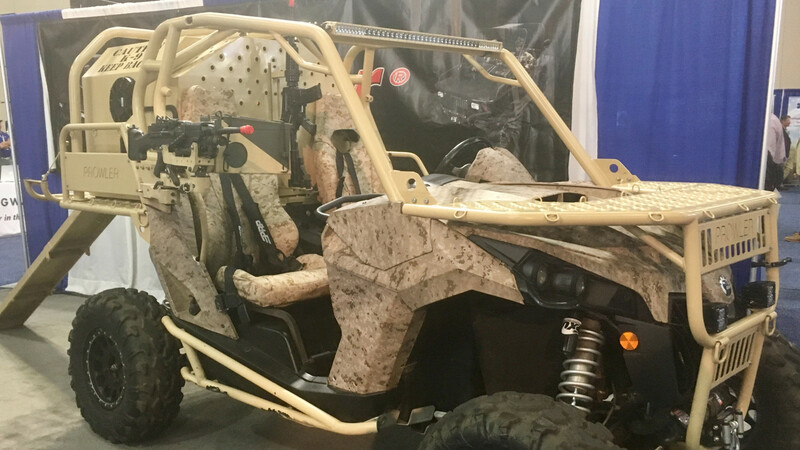 On the expo floor, industry contractors show off their gadgetry, ranging from high-resolution facial recognition cameras to ATVs mounted with assault rifles and air-conditioned K-9 kennels. Amid talk of drones, biometrics and expanding enterprise, there is conspicuously little discussion of the border wall. When the wall is mentioned, it is done so with the obligatory “big and beautiful” prefix, or the dubious “sea to shining sea” postscript, each of which elicits an audible chuckle from the crowd. One Border Patrol official likens the wall to a token of acknowledgment for the president. The same official then assures the crowd that no wall will be complete without an arsenal of motion sensors, cameras, lighting and other technology, though these assurances contradict prior reporting that Trump has offered to slash funding for border-security technology in order to pay for his wall. 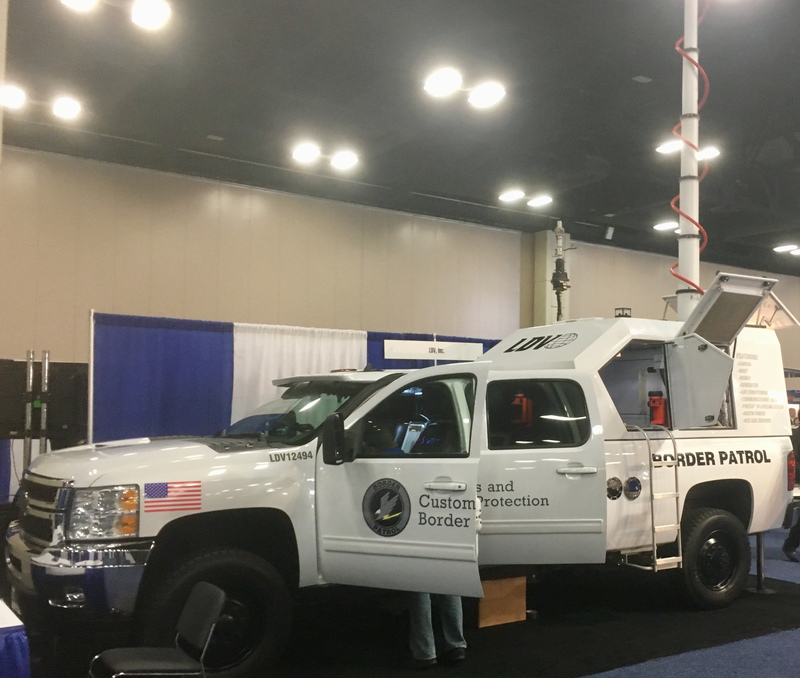 Of course, there was no discussion of topics such as endangered species, land takings or environmental justice concerns at the Border Security Expo. There’s no need. Due to the legal waiver authority granted to Homeland Security under the Real ID Act of 2005, the department’s secretary holds the singular power to waive any and all laws in regard to constructing barriers and roads along the border. This degree of power wielded by the secretary, an unelected official who can nullify any congressionally mandated law at the strike of a pen, is truly unprecedented. Using the Real ID Act waiver, the Trump administration has already waived dozens of environmental and public-health laws to build border-wall prototypes, replace sections of fencing in San Diego and build new fencing in the Chihuahuan Desert of New Mexico. Laws voided by the administration include the Endangered Species Act, National Environmental Policy Act, Clean Water Act, Native American Graves Protection and Repatriation Act and dozens more. Due to this unchecked authority to waive any and all laws, the administration doesn’t have to confront the disastrous implications border walls have for wildlife and communities. And based on recently introduced legislation, the border-security industry may not have to consider the human and environmental costs of the deployment of radio towers, motion sensors, cameras or other gadgetry, either. Though the digital wall is often touted as an environmentally amenable solution, fortifications to the existing network of towers, sensors, drones and cameras will have clear impacts on ecosystems and wilderness areas, especially if laws are waived to expedite their deployment. Much of this digital wall is already in place, officials at the expo explain, and with a seemingly bottomless border-security slush fund, it’s rapidly becoming more powerful. Cameras can detect motion from seven miles away, differentiating between human and animal movement. Facial recognition technology can rapidly tell agents who’s in a vehicle traveling 100 miles per hour, all from a split-second snapshot. The virtual surveillance possibilities are almost limitless. 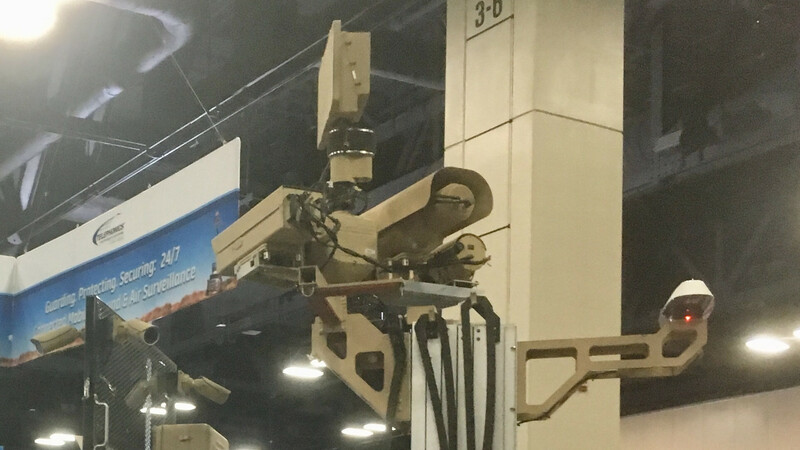 Throughout the expo, far more attention is given to the development of a tactical network of technology than to border walls. One official notes that more than 650 miles of existing border barriers already exist, built in high-traffic urban areas and travel corridors where, from a tactical perspective, these barriers are most effective. Border-security officials are tacticians; it makes sense that the strategy put forth at the expo is one of sophisticated tactical deployment. The wall, on the other hand, is born from a political rather than tactical mindset. It seems that everyone in the conference hall is well aware of this fact. As day two at the expo begins, breakout panels address the fentanyl epidemic, the changing supply routes of drugs coming into the country and the transnational criminal organizations working to undermine border security. Each of these presentations paints a grave picture of threats streaming into the country. Metaphors frequently compare the arrival of people, drugs and even religious ideologies to water. Migrants “flood” across our borders. Drugs “pour” onto our streets. We must “stem the tide” of refugees before we are overrun. According to the forecast given at the expo, it feels as though a cyclone is enveloping the country, and the foreign seas of contraband, disease and criminality are lapping at our feet. Under the Trump doctrine of nativism and deregulation, the border-security industry is poised to win big. And with an annual market valuation reaching upwards of $600 billion, a blank check from the federal government, and little oversight or accountability, it doesn’t matter that our country is no longer in an immigration crisis. There is money to be made. For the border security industry, the stars have aligned — this truly is an era of insurmountable opportunity. works to protect wildlife, ecosystems and communities throughout the U.S.-Mexico borderlands and draw attention to the costs of border wall construction and border militarization.